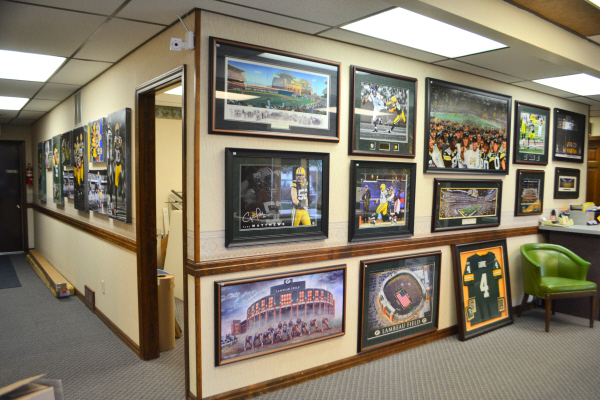 Looking for a quality, creative and experienced picture framer to help you choose the best matting and frames for your projects in the Green Bay, Wisconsin area? Frame of Mind is the best place for you. We have been serving the communities of northeast Wisconsin and the Fox Valley for over 30 years. Located in the heart of Ashwaubenon, we are an easy drive from, Allouez, De Pere, Green Bay, Howard, Oconto, Oneida and Suamico. We specialize in customized picture framing and matting, preserving photos, memorabilia, shadow boxes, jersey and sports team items, canvas stretching, cross stitch and Grandma’s beautiful stitchery and embroidery. Bring in your photos, wedding pictures, family portraits, diplomas, and children’s art or something purchased at Artstreet. We love to help you carefully preserve these items at a fraction of the cost of the big box stores. Building and creating shadow boxes for the display of three dimensional objects is one of most requested services. We design and craft shadow boxes for team items & jerseys, memorabilia, medals and military awards, flags, and pretty much any object you want to display. The creative layout to add dimension will be sure to please. At Frame of Mind, we understand that items you find suitable for framing are important to you and have personal value. We want to capture and reflect your personality. Our goal is to make every project a “WOW”. We want them to be something you can give as a gift or pass down to the kids and “be something the kids will want and fight over”. Stop in at the shop and let us showcase your ideas that reflect your Frame of Mind.